This article is a result of research undertaken for a thesis forming part of a Master's Degree in History of Art at University College, London in 1999. Examining the Chapel of the Castle of Kronberg near Frankfurt/Main, the thesis argues that the former had been built with a very distinct ideological and theological programme as a burial and chantry chapel to be used by three different branches of the same family, all resident in Kronberg Castle. 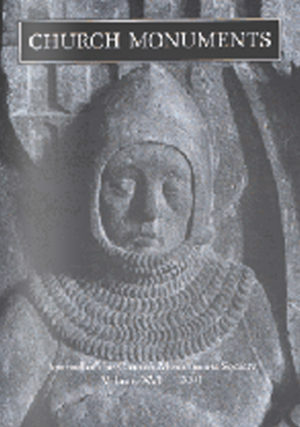 The article is a revised extract concentrating on four military tomb effigies in the chapel. These four effigies are not only interesting sources for the study of late 14th century arms and armour but also show a remarkable diversity in the artistic quality. This paper concerns the discovery of a previously unrecorded contract for the production of alabaster effigies from theworkshop of Thomas Prentys and Robert Sutton at Chellaston. 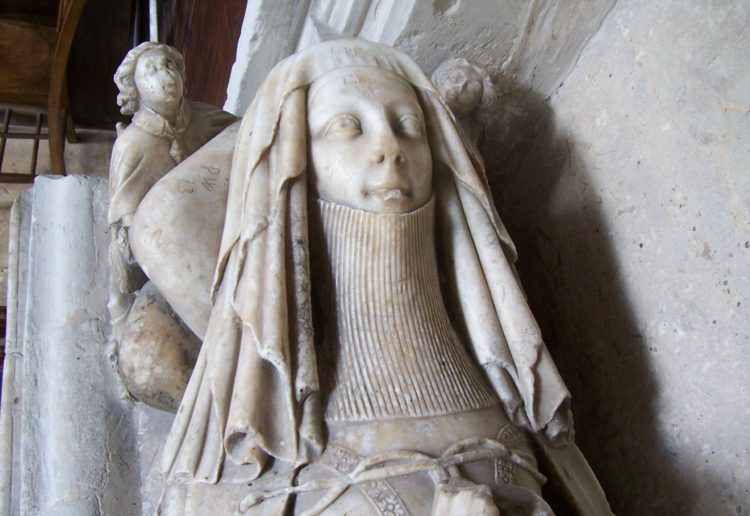 Our perceptions of medieval sculpture are all to often coloured by the chance survival and prone to change with the publication of previously unknown documentation. Some works cannot be ignored, documentation or not, but others come to prominence because they are documented, whilst other contemporary work of equal merit is either largely ignored or judged in the context of the documented piece. Thomas Kirby was once thought to have made a distinctive group of Renaissance church monuments in the Midlands during the 1570's. However doubts have been cast on his existence in recent years. Closer examination of the evidence reveals that the real sculptors were probably long term employees of the Mordaunt family and their close relations, and that they worked predominately from the Totternhoe stone quarries in Bedfordshire. In Ireland the post-Reformation production of images and devises, in funerary sculpture and elsewhere, relating to devotions to Jesus, demonstrates His centrality to popular Catholic religiosity. This paper traces the different motifs used, thereby throwing light on several aspects of Irish Catholic piety during the 16th and 17th centuries. In contrast to many other early modern universities, the University of Oxford was (and still is) organised in colleges. These created a very strong sense of belonging among their members. It has been argued that funerary monuments contributed to the way in which '…[the college] understood and promoted itself.' In contrast to previous studies which concentrated on the academics' learnedness and their differences to the nobility, this paper takes a close look at the ways in which academics at Oxford represented themselves, and what roles the college community played in their understanding of themselves. It can be argued that church monuments in the 17th century underwent such fundamental changes in the way that monumental art was perceived as to mark the century out as perhaps the most important in the development of memorial sculpture at any time in British history. The key to these changes and possibly the most important aspect are those that affected the effigy and the way in which it was viewed within a broader cultural and social framework. It is exactly one hundred and fifty years since the Great Exhibition of 1851 and ninety-six since the death of John Green Waller. He was one of the foremost antiquaries of the Victorian era, as celebrated in his time as Albert Way, Charles Roach Smith and F W Fairholt. He was known variously as an artist, engraver and knowledgeable antiquary, whose pronouncements at the meetings of the Society of Antiquaries were always illuminating. With his brothers Lionel and William Augustus, he was responsible for a series of brasses that rivaled those designed by Pugin. Today the Waller brothers are remembered more for a A Series of Brasses from the 13th to the 16th Century, published in eighteen parts between 1840-1864, than the brasses they designed. This paper looks at the Waller family and places in context their contribution in the design and execution of monumental brasses. It examines J G Waller's antiquarian career in detail for the first time. Gerardine M Mulcahy: An Eminent Sculptor: William Day Keyworth Jun. of London & Hull.